Veterinarian and assistant professor Emi Knafo, V08, knows just how tricky and frustrating keeping bees can be. Last year, the hive at her suburban home had thousands of thriving bees—until neighbors sprayed trees with pesticides. “I only knew what had happened because they warned me afterward to keep my dogs off the grass for 12 hours,” she said. When Knafo opened her hive, all the bees were dead. Backyard beekeeping got even more complicated in January when the U.S. Food and Drug Administration put into effect the Veterinary Feed Directive. The regulations mandate that if antibiotics used in human medicine will be ingested by food-producing animals, the drugs will need to be prescribed by a veterinarian. As producers of honey, bees fall under the FDA directive, regardless of whether the insects are kept by a hobbyist or large commercial operation. The new rules seek to address agriculture’s role in limiting the rise of antibiotic-resistant bacteria, Knafo explained, as well as reduce antibiotic residues in honey and other foods that could harm unsuspecting consumers with allergies. Bee keepers have long relied on several antibiotics common in human medicine to treat hives for diseases such as European foulbrood, a bacterial illness. Such bee antibiotics were once sold over the counter, but now these drugs will be available only once a veterinarian has conducted an exam to ensure they’re truly needed. “Veterinarians are going to have to go out to visit bees in the yard and actually open hives to inspect them,” Knafo said. And that’s a sea change that will likely confound both veterinarians and bee keepers, at least in the near future. “Finding a doctor for your bees is not as simple as finding one for your dog or cat,” said Rachael Bonoan, president of the Boston Area Beekeepers Association and a Tufts Ph.D. candidate in biology. Knafo—who learned beekeeping in high school alongside her mother—is trying to bridge that care and knowledge gap. In Cummings School’s new bee medicine selective, first offered last spring, Knafo and guest lecturers taught ten veterinary students about basic honeybee biology, equipment, how to assess a hive’s health, and proper care and handling of the bees. (Shortly after the new directive took effect, she led a continuing-education workshop for practicing veterinarians.) A field trip to the Massachusetts Department of Agriculture apiary in Amherst—where the state’s honeybee program inspectors conduct education, outreach, and research—allowed students to don some protective gear and put what they’d learned into actual practice. Now, Knafo is expanding the course’s hands-on training. 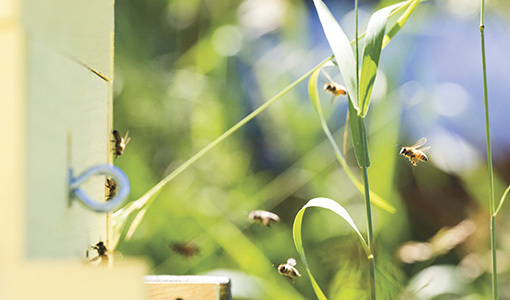 She’s using a Tufts Innovates grant to install five hives around campus, each with solar-powered wireless data loggers and a live video feed of the bees inside, plus a sixth portable hive with see-through Plexiglas sides for in-person observation. As the program develops, Knafo hopes to offer an introductory selective for first- and second-year students, with an advanced selective offered to third- and fourth-years. Bee keepers looking for veterinarians to inspect and treat hives can find more information at beevets.com.